If you've been following Martin JetPack, you may be aware that you may soon be able to own one and fly around like a bird. All you need is a measly 100,000 dollars. The jetpack can climb at more that 1000 feet per minute and cruise at 100 kilometers per hour (around 62 miles per hour) for about 30 minutes of flight time. Now that's scary. 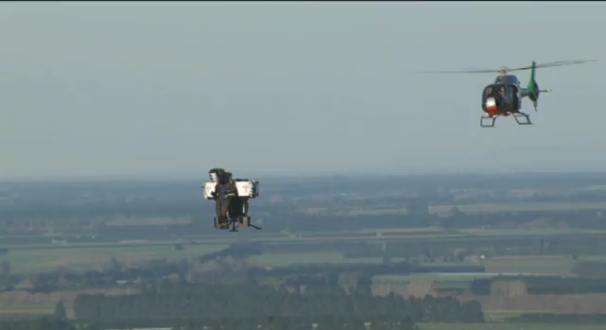 The flight was controlled by radio control in the chasing helicopter. A person wasn't actually flying the jetpack; instead, a humanoid dummy rode it, allowing the crew to test the jetpack with the proper wight distribution. After cruising along for a while at around 3000 feet, the jetpack deployed a ballistic parachute as part of a safety system test--the first such test of the jetpacks ballistic parachute safety system. The jetpack took some damage upon landing, but the company said that if an actual human were onboard they likely would have been able to walk away from such a landing. Make sure to check out the full details at Martin JetPack and check out the video on YouTube. While this flight lasted only 10 minutes, it was a test that inched jetpacks ever closer to our garages. This flight-test was also part of the company's final development phase of the Jetpack's technologies, and it hopes to have the first manned and unmanned (UAH) versions delivered to certain key customers within the next 18 months--after almost 30 years of research and development. The Martin JetPack is really sweet because it doesn't require a pilot's license to fly in the U.S. (although it doesn't hurt to have one). According the FAQs, the jetpack can be used for recreation use as well as defense and emergency response.